Cabral’s life was that of a revolutionary, specifically that of an African revolutionary. His ideas &, more importantly, his practice have a powerful influence today. 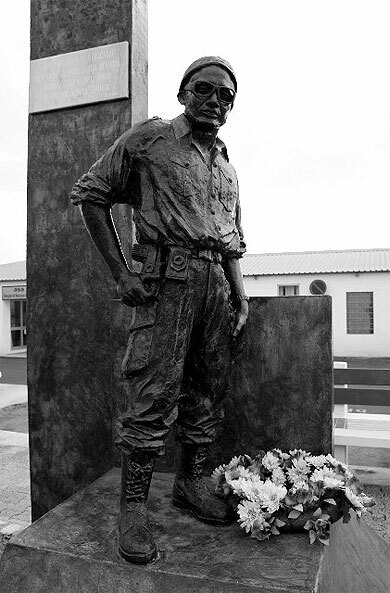 It has been argued, more than once, that his leadership of the PAIGC dealt a death blow to Portuguese Colonialism & Fascism, which rippled beyond his own Guinea-Bissau & Cape Verde. 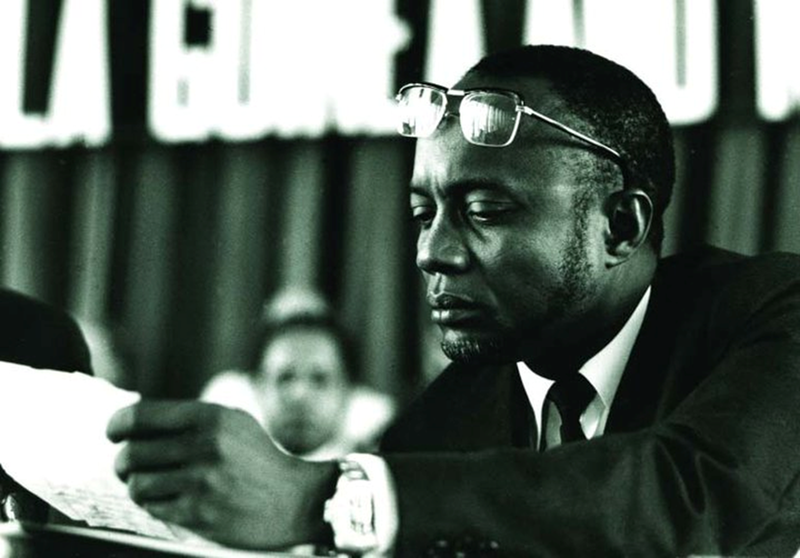 Fidel Castro, speaking in 1966, said that Cabral was ‘one of the most lucid and brilliant leaders in Africa’ (Victoria Brittain, ‘Africa: a continent drenched in the blood of revolutionary heroes‘, The Guardian (17 January, 2011).). What can be stated with absolute certainty is that his party led the most successful nationalist movement in Black Africa. It was the 1st to achieve independence by armed struggle. In order to understand the thought & struggle of the PAIGC, I think it is important to meet Cabral on his own terms. At the same conference in Havana where Fidel paid homage to him, Cabral delivered 1 of his best known speeches, The Weapon of Theory. 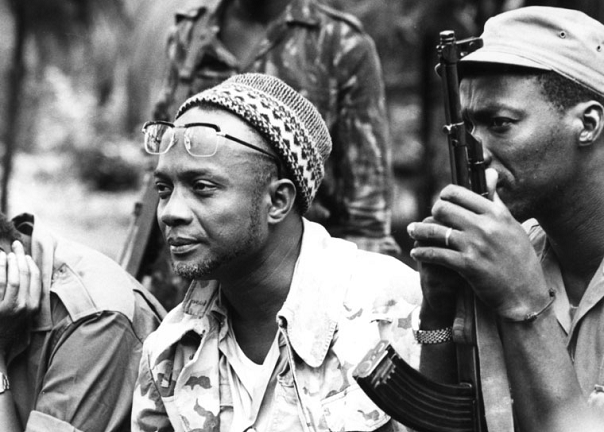 In this he says that, ‘national liberation and social revolution are not exportable commodities; they are, and increasingly so every day, the outcome of local and national elaboration’ (Amílcar Cabral, The Weapon of Theory (1966).). What he meant by this can be phrased simply: there is no blueprint for liberation. 1 tactic will not secure Revolution across the globe. Cabral argued that it was 1st necessary to understand the Colonial contexts of both Guinea-Bissau & Cape Verde. He always considered the 2 areas as a single nation, as is reflected in The PAIGC Programme, which demands ‘economic, political, social and cultural unity.’ (The PAIGC Programme (1969).) However, the socio-economic relations of each area are quite different & the Portuguese ran them as separate colonies. The commonality came from an exceptionally high mutual emigration-immigration of the indigenous populations. Here, we will cover only Guinea-Bissau, as the PAIGC was never able to wage its struggle in Cape Verde. “Portuguese Guinea”, as it was named in 1886, is a small territory of around 32,000sq-kms. It is smaller than Britain. Bordering the French Colonies of Senegal to the North & Guinée to the East & the South, the land is divided into 2 distinct areas. Along the coast, the land gives way to deep estuaries & rivers, bordered by mangroves & swamp forests. Inland stand savanna & forests, with some dense rainforests to the South. The coast is dotted by small islands. A final remark on the context of Guinea-Bissau. The economy of the country was, & remains to this day, predominantly agricultural. Until the advent of the nationalist war of liberation, waged by the PAIGC from 1962 onwards, the country was self-sufficient in food. This did not mean that it was economically independent: in 1960 the value of imports was almost double that of exports. An equally important point is that the agricultural produce of distinct areas allowed the Portuguese to deepen cultural divides already present in tribal culture. According to Cabral’s 1953 agricultural survey, the Fulas produced 43.61% of Guinea-Bissau’s groundnuts. (Cabral, ‘Recenseamento agrícola de Guiné: estimativa em 1953’, Boletim cultura da Guiné portuguesa, 11, 43 (July, 1956), pp.7-243.) In the same year, groundnuts accounted for 70% of Guinea-Bissau’s exports. The economic dominance of the Fulas created, in practice, a close tie with the Portuguese Fascists. Throughout the war they formed a section of society often allying with Portugal, what Cabral alludes to as ‘the group which we consider semi-feudal […] tied to colonialism’. (Cabral, Brief Analysis of Social Structure in Guinea (1969).) Sharpening these cultural divisions was an important tactic for Portugal. The aim of this elaboration is not to provide a comprehensive history of the struggle for national liberation in Guinea-Bissau, but to provide an overview. 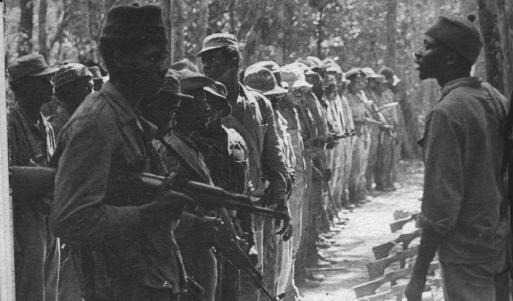 In short, I will provide a brief history of the PAIGC & its struggle, whilst centring on 3 distinct moments: the formation of the PAIGC & the initial training of guerilla forces in Conarky; the Cassacá Congress; the practice of the PAIGC in the liberated zones. Each of these moments marks an important contribution on the part of Cabral. The idea is to provide a sense of the PAIGC’s war & Cabral’s leadership, not a strict history. Threatened with arrest, many party members were forced to flee. Cabral came back to Bissau & met with the PAIGC leadership on 19 September, 1959. The meeting was kept secret. This represented a break with the early tactics of urban agitation & the infiltration of legal organisations. (Cabral, Revolution in Guinea (London: Stage One, 1969), p.31.) Instead, the meeting agreed ‘to shift the focus of action from the urban centres to the countryside; to transfer to secretariat outside the country; and to prepare the liberation of the country by all means, including war.’ (Chabal, p.57. Italics in original.) Mário de Andrade, a PAIGC comrade, later admitted that in ‘the first analysis of the anatomy of our societies, we sought to discover at all costs the social component that determined history. This attitude was translated into the mobilisation of what we improperly used to call the “proletariat” of the urban centres.’ (Mário de Andrade, ‘Amílcar Cabral et la guerre de peuple’, Afrique Asie, 66 (23 September – 4 October, 1974), p.vii.) In a country primarily relaint upon a peasantry, at best in a semi-feudal period of development, this strategy was correctly viewed as impotent by the PAIGC leadership. Another, particularly striking, aspect of Cabral’s training regime was his focus upon practical education. This was expressed in extremely creative ways. Having studied the social characteristics, traditions, religion etc of a particular ethnic group in Guinea-Bissau, trainees were made to perform their politcal agitation in the form of theatre. (Chabal, p.64.) This captured a sense of the actual process of agitation, whilst simultaneously cementing Cabral’s strategy in the young recruit’s mind: the success of the PAIGC require integration of militants into the villages. By late 1962, the PAIGC was under considerable stress to launch its military offensive. A number of self proclaimed PAIGC groups, made up of fresh Balante recruits had already engaged in action. The Portuguese, following the conclusion of mass-military intervention against the Angolan uprising, strengthened their military presence in Guinea-Bissau considerably between 1961 & 1962. Internal & external pressure was mounting, leading the PAIGC to launch full-scale military action in the South during the last part of 1962 & in the North in 1963. (Chabal, pp.72-75.) Military expansion was rapid: by July 1963, the Portuguese Defence Minister, General Manueal Gomes de Araujo, admitted that the PAIGC had ‘penetrated a zone equivalent to about 15 per cent of the province.’ (Cited in Chabal, p.58.) By the end of 1963, the PAIGC claimed that 1963 that 1 3rd of the country was liberated & could be kept under their permenant control. This put considerable strain on the loosely organised party. The PAIGC had operated by placing faith in its recruits, allowing them to operate in essential independence. Membership was an open-door process. This led to enormous difficulties in organisation & the growth of 3 political trends, contrary to the interests of the national liberation struggle: militarism, which advocated an approach of terrorism both toward the Portuguese & the indigenous Africans; localism, which consisted in refusing to expand 1’s interests beyond an immediate village etc; cultural factors, which occasionally undermined the struggle. Cabral noted that, ‘After a year of armed struggle, the party was already sick.’ (Cabral, ‘Fizemos o Congresso de Cassacá para pormos o partido no caminho certo’, Nô Pintcha, II, 137 (17 February, 1976).) The Cassacá Congress was held in February, 1964, to combat these trends. Militarism was destroyed & actively crushed. Cabral stated that ‘those who were found guilty [of military terror] were taken prisoner at the end of the Congress and we sent for those who had not come. They resisted and they were liquidated.’ (Cabral, ‘Fizemos o Congresso de Cassacá’.) Execution was, in point of fact, the only viable tactic for the destruction of the trend. Many of the local guerilla leaders guilty of militarism came to the Congress with armed escorts & a still greater number of militarists resisted PAIGC orders with armed force. The execution of these commanders, where removal otherwise was not possible, allowed the party to install politically conscious leaders in guerilla groups, during a perpetual war against Portugal. (Chabal, pp.78-79.) This was absolutely necessary & was an important moment for progressive forces within the PAIGC. This demonstrates an incredibly perceptive approach to leadership. It is a concrete example of what Cabral means in National Liberation and Culture, when he writes: ‘we may consider the national liberation movement as the organized political expression of the culture of the people who are undertaking the struggle.‘ Not only would the reification of the irán in a nationalist sense combat the military problem, it would give a renewed impeteus to the struggle itself. The very forests were in support of the PAIGC. Economic reconstruction focused primarily upon agriculture. As early as the 1950s, in his work as an agronomist Cabral had denounced the cultivation of Colonial export crops. He argued that this cultivation led to the ‘progressive decrease of the possibilites of exploiting the land, to the lack of cultivable soil, to a decrease in fertility, to soil destruction through erosion and laterisation and, consequently, to the deterioration of the already precarious economic situation of the indigenous peasant.’ (Cabral, ‘Queimadas e pousios na circunscrição de Fulacunda em 1953’, BCGP, 9, 35 (July, 1954), pp.627-643.) When considering the economic reconstruction in the liberated zones he insisted that villagers should cease production of Colonial exports – groundnuts, for example – & to cultivate food. (Chabal, p.110.) It would be easy, given Cabral’s statements in the 1950s, to see this as a matter of practicality. This would ignore a central conception of the PAIGC leader, often overlooked because of its correspondence with Marxist-Leninist thought. Cabral believed that ‘the basis of national liberation, whatever the formulas adopted on the level of international law, is the inalienable right of every people to have its own history, and the objective of national liberation is to regain this right usurped by imperialism, that is to say, to free the process of development of the national productive forces.’ (Cabral, TWT.) The economic resconstruction of agriculture is part of this in the context of Guinea-Bissau. Progress was far more pronounced in the realm of education & healthcare. As early as 1964 there were 4,000 students in aproximately 50 schools across Guinea-Bissau. By 1971, this had grown to 14,531 students across 164 schools – with roughly 89 pupils & 56 teachers in each school. Internatos – essentially boarding schools – were introduced in 1970. (Chabal, pp.115-117.) Whilst progress in healthcare was slower, by 1971 the PAIGC had 18 doctors & 20 medical assistants in its own ranks, alongside 23 foreign doctors sent as aid & 335 nurses. Healthcare took the form of “health brigades”, reminiscient of China’s “barefoot doctor” movement, which toured the country providing healthcare wherever needed. In 1964 the PAIGC did not have a single doctor. (Chabal, pp.119-121.) Both of these improvements represent enormous achievements, given the deprivation of Guinea-Bissau in regards to these assets under Colonialism. The assassination of Cabral in 1973 was a last attempt to destroy the liberation struggle: a conspiracy to seize leadership of the PAIGC & divert it. It was unsuccessful. A few months later, the party went ahead with the planned declaration of independence. Cabral’s contribution to the liberation war of the PAIGC & to the international struggle against Imperialism was, above all else, a concrete 1. The struggle waged by the PAIGC is a powerful example of the power of the oppressed & of the vanguard party in leading their struggle. His innovative, discursive & flexible form of leadership by many counts was fundamental to the struggle against Portuguese Fascism, both in Guinea-Bissau & across all of Africa. This is to say nothing of his abilities in international diplomacy. Nor is this to diminish Cabral’s theoretical contributions. To me, Cabral is clearly a Marxist. More than this, he belongs to the theoretical continuity of Marx, Engels, Lenin, Mao, Guevara & Castro. This trend, I would argue, possess several pronounced characteristics. Foremost, it is against the mechanical application & understanding of Marxism in any form. With this go several considerations: the primacy of politics &, within this, an understanding of agency; the development of tactics on a contextual-materialist basis; a deep, powerful understanding of the role that organisations & even individuals can play in shaping Revolution. What wider, theoretical points Cabral made – particularly in The Weapon of Theory – are equally as concrete as his practice; they are the concrete expressed as abstract, taken out of form & realised as general social relations – in a word, concrete theory. I would also argue that what was lost with Cabral’s assassination was the possibility for Socialist construction in Guinea-Bissau in the immediate sense. Again, there is ample evidence for this. Cabral’s understanding of Socialist development was that it requires the development of the social means of production, creating a set of general relations qualitatively different to that experienced. In the context of Guinea-Bissau, this meant the development of agriculture – diversification etc – & not a leap to industry. This task was not adequately taken up by any section of the PAIGC leadership other than Cabral. These points will, undoubtedly, be hotly contested – Tricontinental Marxism generally is. I will not undertake an argument upon this here. Instead, I think Cabral’s contribution can be summarised in 2 points. To me, these reveal the power of his concrete theory & practice. There was not a revolutionary class in Guinea-Bissau. In his training of the initial wave of guerillas, he created a section of society with a revolutionary ideology. In a sense, he created a revolutionary class. There was not a national culture in Guinea-Bissau, Colonialism stopped the indigenous people’s historical development before this developed. In his universalising & nationalising of the irán, Cabral was creating a national culture. Reblogged this on The Cog-Wheel & Machete.